Frankfurt/Main, 01 October 2018 // LORENZ userBridge.18 in Prague was completely sold out once again this year, drawing more than 180 attendees from industry, consulting and regulatory health agencies around the globe. 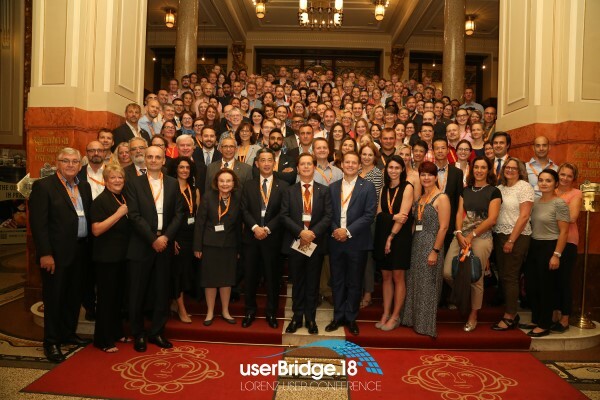 Hosted at the centrally-located Hotel Ambassador Zlata Husa from 18-20 September, the conference was packed with presentations, table tutorials and panel discussions covering current issues in the Regulatory Affairs sector, all in line with the userBridge motto: “Learn – Discuss – Interact”. The event kicked off with a LORENZ keynote presentation showcasing the company’s move to a shared business logic of its solutions using semantical interoperability within the LORENZ Foundation. Christian Kaas, Managing Director Research & Development at LORENZ, also gave live demonstrations of the company’s Regulatory Information Management (RIM) approach and Adam, its virtual regulatory NLP Assistant. The RIM topic was also echoed in many other userBridge presentations including “RIM – a single system or a happy family” and “RIM implementation and integration. Tailoring the evaluation for the right solution”. The wide range of userBridge presentations captured the spirit of the times. Prof. Sir Alasdair Breckenridge considered the possible implications of the Brexit on the Regulatory Affairs world. Presentations about IDMP and SPOR also gave participants a better understanding of these emerging trends in the sector. Many prominent Regulatory Affairs consultants and industry experts shared their insights with participants, including Remco Munnic of Asphalion, Elke Schydlo of Sandoz, and Dr. Andreas Franken of the German Medicines Manufacturers’ Association (BAH) among many others. Agencies were also well represented, including an update from Health Canada by Vianney Caron and a presentation from Dr. Klaus Menges of the German authority BfArM. A selection of 24 different table tutorials – small-scale learning and Q&A sessions on specific topics – gave attendees the chance to pick and choose several sessions. The bandwidth of tutorials ranged from LORENZ product news such as “LORENZ Automator: Do you know Adam?” and “What´s new in LORENZ docuBridge?” to more broad Regulatory Affairs topics such as eCTD 4.0 and getting submissions ready. In the breaks between the presentations and tutorials, participants had plenty of time to network with LORENZ representatives and other colleagues in the Regulatory Affairs arena. During the evening events, after the presentations, they also had time to talk in a more open way. This way, LORENZ offered an environment perfectly made to learn, discuss and interact with colleagues outside of the daily routine.